Pearl of The Scarlet Letter is an independent child, gorgeously arrayed, who attracts the cruelty of Puritan children, the attention of the governor as well as other town elders who wish to ensure her proper Christian teaching, and the devoted love of her mother. Pearl is impetuous, difficult to control, occasionally kind and loving, and always fascinated with the scarlet "A" that covers her mother's breast. She intuitively knows there is a connection between her mother and the minister, Reverend Arthur Dimmesdale, who always holds his hand over his heart. Although considered to be symbolic of the adulterous sin her parents committed, Pearl is in reality more an untamed child of nature. With people and within the town or houses, she is an oddity, but within the woods or by a stream, she is in her own, uncensoring element. Pearl plays a part in the following 19 chapters of The Scarlet Letter: 2, 3, 4, 5, 6, 7, 8, 10, 12, 13, 14, 15, 16, 18, 19, 20, 22, 23, and 24. She plays a significant role in Chapter 6 - "Pearl;" Chapter 7 - "The Governor's Hall;" Chapter 8 - "The Elf Child and the Minister;" Chapter 12 - "The Minister's Vigil;" Chapter 15 - "Hester and Pearl;" Chapter 16 - "A Forest Walk;" Chapter 18 - "A Flood of Sunshine;" Chapter 19- "The Child at the Brook-Side;" and Chapter 23 - "The Revelation." In Chapter 2 - "The Market Place" Hester Prynne is temporarily taken out of jail in order to be displayed on the scaffold for all the town to stare at. Pearl is initially introduced in The Scarlet Letter as a 3-month-old baby leaving the prison with her mother Hester clasping her to her breast where the letter A has been embroidered. Our first image of her shows her turning away from the bright light of day because her life up until now has been in dim light or darkness of the prison. Hawthorne perceives the baby both as the offspring of a Virgin birth and as an offspring of dreadful sin. Finally Hester equates the baby with the shame of her sin and realizes that both of them will be the object of scrutiny of the townspeople. Full text of Chapter 2 - "The Market Place"
In Chapter 3 - "The Recognition," no one can force Hester to identify the father of her baby. When Pearl initially meets Arthur Dimmesdale, she holds up her arms to him whereas when Roger Chillingworth spots her, she cries out in pain. Neither man claims her, and Chillingworth uses her as he begins his quest to figure out with whom Hester sinned. Full text of Chapter 3 - "The Recognition"
In Chapter 4 - "The Interview," Hester and her missing husband are reunited. Back in prison with her mother, Pearl is in immense pain. It is suggested that nursing from her mother has caused to internalize Hester's anguish and not nourishing sustenance. Roger Chillingworth, a healer, is summoned to see to the ailing babe and her mother who distrusts her long-missing husband's intentions towards the child. Chillingworth is professional and quiets the bawling child. 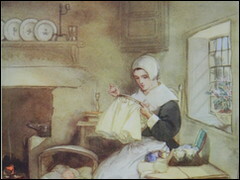 Full text of Chapter 4 - "The Interview"
In Chapter 5 - "Hester at her Needle," Hester practices her needlework so she can support herself and her baby. While Hester dresses herself somberly and makes a living as a seamstress, she designs and sews elaborate, fantastic clothing for her little Pearl. Townspeople and strangers alike will gawk at both the scarlet "A" on her breast and at her child. Full text of Chapter 5 - "Hester and her Needle"
In Chapter 6 - "Pearl," the young child is introduced. All of chapter 6 focuses on Pearl as a baby and young child: her appearance, her dress, her interaction with other children as well as her environment, and her connection with the scarlet letter. What follows is a series of questions, which can be answered from the chapter, which is included in its entirety. Why does Hester name her daughter Pearl? What is the great price Hester must pay and what does she fear about the child? What is special about Pearl's physical appearance and her clothing? What is the passion contained within her personality? How should Hester discipline this willful child, who is a spirit onto herself? As Pearl grows up, will she connect with other children or forever be an outcast? Will an evilness in her nature control her interactions with the Puritan children? How does Pearl play within her natural environment outside their cottage home? How does her play mirror her observations of the adult and children Puritans? How does Pearl react to the scarlet A embroidered on her mother's chest? How do Pearl and Hester talk about the scarlet letter and Pearl's paternity? Full text of Chapter 6 - "Pearl"
In Chapter 7 - "The Governor' Hall," Hester comes to confront the governor. When Governor Bellingham and his cronies wish to remove the potentially demonic child Pearl from her mother Hester in order to save her soul through religious tutoring which they feel is lacking at home, Hester visits the Governor's mansion determined to keep her child. On their route to the governor's home, Pearl, a fickle embodiment of the scarlet letter both in dress and passions, ferociously repels the cruel attack of taunting and mud slinging by the Puritan children. The brighter but still selfish side of Pearl is shown as she delights in the day's glorious sunshine. Pearl tortures her mother at the governor's stately mansion by insisting Hester suffer looking at the numerous reflections of the scarlet letter in the shiny armor. The scarlet letter was represented in exaggerated and gigantic proportions. The mercurial Pearl throws a temporary fit when denied a rose from the garden. Full text of Chapter 7 - "The Governor's Hall"
In Chapter 8 - "The Elf Child and the Minister," Hester comes to plea for her child. Governor Bellingworth argues that Pearl, who resembles an elf or a fairy in the minds of himself and his guests. should be taken from her mother, clad in somber clothes, and instructed in religious truths. The governor is horrified at Pearl's sacrilegious answer when asked, "Who made thee?" Two of his guests are integrally connected to Pearl and Hester's lives: the minister Arthur Dimmesdale and the physician Roger Chillingworth. Hester passionately argues that she must be allowed to keep Pearl or else die. She explains that her daily shame will help her instruct the child wisely. When Hester's appeal almost threatens Arthur Dimmesdale for his support, he argues fervently for Hester to be able to keep the child. Whimsically, Pearl shows rare affection to the Minister Dimmesdale, who shyly kisses her before she cavorts away. There is an undeniable bond between the two. Mistress Hibbons, the governor's sister purported to be a witch, bids Hester join her to see the "Black Man" in the forest. Hester, having convinced the governor that she should keep Pearl, proudly refuses to accompany Mistress Hibbons. Full text of Chapter 8 - "The Elf Child and the Minister"
In Chapter 10 - "The Leach and His Patient," Hester and Pearl are observed by Chillingworth and Dimmesdale. While Roger Chillingworth and his patient Arthur Dimmesdale converse about the secret sins of men, they spy Hester in the cemetery with Pearl merrily dancing on grave stones and then decorating her mother's bosom with burrs, one of which she tosses at Dimmesdale. Full text of Chapter 10 - "The Leach and His Patient"
In Chapter 12 -"The Minister's Vigil," Dimmesdale mounts the scaffold. On the night when Arthur Dimmesdale does penance on the scaffold where Hester holding baby Pearl had stood accused of adultery, Dimmesdale experiences a multitude of emotions. When the tortured minister laughs, his laughter is echoed by the elfish laughter of Pearl. Dimmesdale bids Hester and Pearl to come onto the scaffold, where they link hands, and he is energized. However, when Pearl asks him to publicly hold mother and child's hands on the scaffold in the daylight, he refuses but promised to do so at judgment day. When Roger Chillingworth appears out of the dark, the terrified Dimmsdale panics and asks who he is. Pearl offers to reveal his identity. In Chapter 14 - "Hester and the Physician," Hester tells Chillingworth that she intends to break her promise to him. Before Hester confronts the physician Roger Chillingworth about the poor plight of Arthur Dimmesdale and her plans to tell the minister of Chillingworth's true identity, she bids Pearl go play along the bank of a stream. Hester admits that she believes that the four of them: the physician, the minister, herself, and Pearl are trapped in a hopeless mess. Full text of Chapter 14 - "Hester and the Physician"
In Chapter 15 - "Hester and Pearl," Hester and Pearl linger in the woods and Pearl questions her mother. Guiltily, Hester realizes that she hates her estranged husband. When Roger Chillingworth departs, she calls Pearl to her side. The child has been playing with the playthings that nature provides and feels quilt when she maims a bird. As always Pearl is fascinated, perhaps obsessed, with the scarlet "A" on her mother's bosom and so fashions a similar "A" made of green seaweed upon herself. Pearl shows off her sea-green "A" to her mother who questions her about the meaning of the scarlet "A". Pearl answers readily that the scarlet A is on Hester's bosom for the same reason that the minister keeps his hand over his heart. Pearl now asks Hester what does the A mean and why does the minister hold his hand over his heart. Hester, surprised at the gentle seriousness of her daughter, begins to wonder if Pearl might now be able to be a companion to Hester. She analyzes the strengths and deficits of Pearl's character. She gives Pearl a frivolous, false answer to her questions. Hester has been false to the scarlet letter for the first time in her life when she lies to her daughter. Pearl persists in asking about the connection between the minister and her mother. Full text of Chapter 15 - "Hester and Pearl"
In Chapter 16 - "A Forest Walk," Hester and Pearl seek the minister in the woods. On the day Hester sets out with her constant companion Pearl to meet Arthur Dimmesdale so she can tell him the truth about Roger Chillingworth, the forest gives them shelter from spying eyes and reflects their personalities. The sunshine seems to favor Pearl and shun Hester. Pearl questions her mother about the Black Man that she has heard tales about and wonders if the man Hester is meeting in the Black Man. Later, she ironically wonders if the Black Man put his mark upon the minister, causing him to have his hand over his heart. Hester requests that Pearl give her some privacy, so Pearl goes to listen to the "unintelligible secret" of the stream, paralleling the secret about her mother and the minister who arrives, "haggard and feeble" but lacking his usual look of suffering. The forest is already healing them and giving each of them a space to breathe freely. In Chapter 18 - "A Flood of Sunshine," Hester tries to reconcile Dimmesdale and Pearl. In the forest as Hester and Dimmedale resolve to flee the taint of their sin of adultery and as the sunshine temporarily shines upon them, Hester removes her scarlet letter and tosses it toward the stream while she lets her hair cascade down her back. Eagerly, she tells her former lover that he must come to know and love Pearl. He is uncertain of his reception with the child whom he fears. At the same time, Pearl finds companionship in the woods and plays contentedly. Seeing Arthur Dimmesdale, Pearl's pace becomes hesitant. Full text of Chapter 18 - "A Flood of Sunshine"
In Chapter 19 - "The Child at the Brook-Side," Pearl returns to her mother's side. Their love rekindled, Hester and Arthur Dimmesdale watch Pearl, the "visible tie that united them." Hester warns Pearl's unacknowledged father to be calm while Dimmesdale admits he is fearful of this child and eager and fearful for this interview. As Pearl is mirrored in the brook, Hester feels a distinct separateness from the child who has been her constant companion. Pearl, seeing that her mother has changed, remains apart from the couple while Hester urges her daughter to come and know the man who will be her new friend and will love her. Pearl insistently demands that her mother pick up the flung away scarlet letter and return it to its proper place on her chest. The minister begs Hester to pacify the child and give in to her demands. Pearl, victorious, rewards her mother with tenderness and kisses for herself and the scarlet letter. However when the minister kisses her, she races back to stream sanctuary and washes it off. After all, he will not go back to town hand in hand with his daughter and her mother. Full text of Chapter 19 - "The Child at the Brook-Side"
In Chapter 20 - "The Minister in a Maze," Hester tries to reconcile Dimmesdale and Pearl. The minister departs and casts one look more at Hester and Pearl before he returns to the town and has irreverent imaginary dialogues with townspeople who would be shocked at his blasphemy. Full text of Chapter 20-"The Minister in a Maze"
In Chapter 21 - "The New England Holiday," Hester and Pearl observe a town holiday. During the holiday to celebrate the new governor taking his office, Pearl and Hester join the townspeople, Indians, sailors, and other visitors in the market place. Pearl's dress captures the brilliancy of nature while her mood is in "sympathy in the agitations" of her mother soon to flee this judgmental community. A curious child, Pearl questions the holiday behavior of people and the friendliness of their former jailer. Pearl asks if the minister will be present and if he will join hands with them before she gives an astute description of his isolated loneliness. Full text of Chapter 21 - "The New England Holiday"
In Chapter 22 - "The Procession," Pearl is fascinated and enlivened by the town holiday and her mother's strange mood. Pearl delights in the music and marching in a nervous, agitated way. As Hester watches the minister and questions if their former possible deep bond can really be rekindled, Pearl questions the identity of Arthur Dimmesdale, who seems a stranger to both of them. Pearl's wild nature entertains the crowd as well as the shipmaster who was arranging Hester's and Dimmesdale's passage to England. Pearl becomes the messenger for the ship captain, bringing a message of despair to Hester. Full text of Chapter 22 - "The Procession"
In Chapter 23 - "The Revelation," Pearl is fascinated and enlivened by the town holiday and her mother's strange mood. After the much beloved Arthur Dimmesdale gives a memorable sermon, the crowd is stunned as he beckons Hester and Pearl to join him on the scaffold. The minister's physical presence is weak but his spiritual essence is strong. The desperately shaken Roger Chillingworth vainly attempts to stop Dimmesdale, but Pearl embraces him as Hester slowly joins him. The frenzied crowd watches the pageant play out. Even in his determination, Dimmesdale asks Hester if this public unmasking is better than their fleeing to a safe haven in England. Does the minister reveal their secret or not? Dimmesdale asks Pearl to kiss him, and the child kisses him and weeps upon her father, giving her hope of future that won't be a constant battle. Full text of Chapter 23 - "The Revelation"
In Chapter 24 - "The Conclusion," the future of Hester and Pearl is glimpsed. Within a year of Dimmesdale's dramatic death, Roger Chillingworth withers away and dies, leaving Pearl a fortune. She and her mother depart for England, where it is rumored that Pearl stays and marries while her mother returns to her little cottage and receives generous gifts from her overseas daughter. Full text of Chapter 24 - "The Conclusion"
Hester Prynne plays a major role in The Scarlet Letter, appearing in all but a few chapters. Her struggles with the demands placed upon her by her own conscience, her role as a mother, her culture, and her heart allow Hawthorne to develop a multi-faceted character, one whose own nature reflects many of the meanings that come to be associated with the scarlet letter A. Her absence from chapters 9, 10, and 11 adds to their darkness as Hawthorne focuses on the relationship and tensions between Chillingworth and Dimmesdale. By the end of the novel, Hester has endured pain and loss, but returns to the Puritan settlement in New England where the narrator claims "there was a more real life for her" than in the old England to which she had retreated after Dimmesdale's death. In Chapter 2, before he introduces Hester Prynne and her plight, Hawthorne describes the women of this Puritan settlement, emphasizing their rigidity and hard-heartedness, to emphasize Hester's difference from them. Hawthorne then introduces Hester Prynne, describing her appearance and the striking boldness of the scarlet letter A that she has embroidered on the bosom of her dress. Alone upon the scaffold, Hester must endure public exposure and the scrutiny of the entire community as part of the punishment meted out for her sin of adultery. While she stands upon the scaffold, Hester thinks back over the course of her life. In Chapter 3, Hester recognizes her husband, who now goes by the name of Roger Chillingworth standing amid the crowd of onlookers. While she continues to stand upon the scaffold, Hester is addressed first by the chief clergyman, the Reverend John Wilson, and then by the Reverend Arthur Dimmesdale, who asks her to name her partner in adultery, which Hester refuses to do. Once she has returned to her jail cell in Chapter 4, Hester receives a visit from Roger Chillingworth, who offers a sleeping potion to calm Pearl and Hester. While Hester and Chillingworth converse, he asks her to reveal her partner's name. When she refuses, Chillingworth asks that she keep the secret of his identity as well, placing another burden upon Hester. In Chapter 5, Hester is released from prison and must face her life of solitude. Although she has few resources, Hester supports herself and her child through the embroidery that she does. Hawthorne places Hester in the role of an artist through the creativity she exercises with her needle. The community values the needlework Hester does, but Hester feels that she remains an outsider and senses constant reminders of the punishment she has incurred for her sin. Hester believes that her own sin and suffering have given her insights into the secrets concealed in other hearts. In Chapter 6, Hawthorne describes Hester's attitudes toward rearing her child and indicates that she questions her child's nature. In Chapter 7, Hester seeks an interview with Governor Bellingham because she has heard rumors that some members of the community wish to remove Pearl from her care. The interview takes place in Chapter 8, during which Hester speaks not only before Bellingham, but also to Wilson, Chillingworth, and Dimmesdale. Seven years have passed when Hawthorne explores the changes in Hester's character in Chapter 13. The narrator comments on her changed position within the community and the ways people have come to think of her. The narrator also explores Hester's inner nature, suggesting that here change has not occurred, at least not the change that the community had expected. Shocked by the condition of Dimmesdale during their encounter on the scaffold, Hester wonders whether she has failed him in some way by not protecting him from Chillingworth. Hester seeks an interview with Chillingworth, during which she confronts him about his treatment of Dimmesdale. Chillingworth acknowledges what he has become, and forces Hester to admit her own involvement in what has occurred. In Chapter 15, Hester reflects on her feelings toward Chillingworth and believes his acts of betrayal are greater than hers. She also faces questioning from Pearl about the scarlet letter, lying to her daughter about the reasons she wears it. In Chapter 17, Hester encounters Arthur Dimmesdale on a woodland. path as he returns from a visit to the minister John Eliot. Hester and Dimmesdale have a sustained conversation in which they admit their lack of inner peace. During this conversation, Hester confesses the true identity of Roger Chillingworth and blames herself for not telling him sooner. She begs Dimmesdale forgiveness, which he grants. During the intimacy of this meeting, Hester and Dimmesdale confess that they have not forgotten what they were to each other. Dimmesdale asks Hester to use her strength to support him, and she encourages him to consider the possibility that they can escape together without being discovered. Having contemplated the possibility of escape, Hester removes the scarlet letter in Chapter 18. Freed from its weight and restraint, she uncovers her hair, revealing her beauty that had been hidden under the burdens that she carried. Believing that she and Dimmesdale have been freed from the constraints their secrets have imposed upon them, Hester wants him to meet Pearl as his child. But Pearl's reaction when she approaches them forces Hester to reassume the scarlet letter, and with it weight of fatefulness that accompanies it. After her encounter with Dimmesdale, Hester contemplates the possibilities of freedom as the community begins its Election Day celebrations in Chapter 21. Her feelings about the possibility of freedom are cut short, however, when Hester learns that Roger Chillingworth has arranged passage on the same ship that she had hoped to use for her and Dimmesdale's escape. In Chapter 22, Hester watches the Election Day processional, looking for a sign of acknowledgement from Dimmesdale. While doing so, she has a brief encounter with Mistress Hibbens, a woman suspected of witchcraft, who says unsettling things to Hester. Hester is further unsettled by the news that Chillingworth plans to accompany Dimmesdale on the sea voyage, feeling that an "inevitable doom" overhangs her plans. She also faces the gaze of many who have not seen the scarlet letter before, reminding her of a never ending scrutiny to which she must submit. When Dimmesdale verges on collapse upon the scaffold in Chapter 23, Hester moves toward him to answer his call for her strength to support him. Hester is once again drawn into the center of public attention as the gathered crowds speculate about the meaning of the minister's words and gestures. Having supported the dying Dimmesdale during his speech before the community, Hester expresses her hope that they might meet in the hereafter, but Dimmesdale believes their sin has been to great to hold out such hope. Years after the final events on the scaffold, Hester returns to her cottage, choosing voluntarily to live on the outskirts of the community and offering consolation to those who suffer turmoil of the heart as had she. Hawthorne claims that in Hester's day the world was not ready for a woman of independent thought and spirit, but that Hester held out hope that "a new truth would be revealed" that would reorder relations between men and women.